Home >Holiday seasons: How to catch more customers for Magento sites? 53% retailers commenced holiday marketing campaigns in September or earlier. 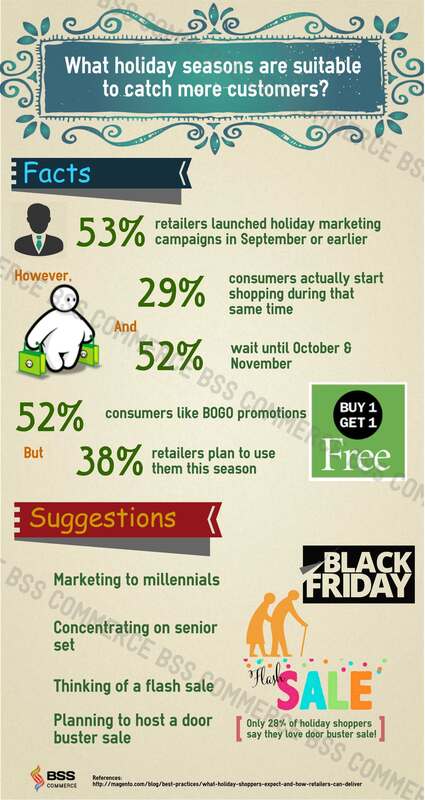 However, only 29% of consumers start shopping in this period, and 52% of them wait until October and November. 38% consumers recommend they won’t shop a site is not offering free shipping; while there are only 18%, online merchants and 30% multi-channel retailers have free shipping in their plan. 52% of shoppers say they like buy-one-get-one promotion programs, but only 38% of merchants raise this idea in the holiday season. 41% of marketers believe in the efficiency of phone marketing while 61% of shoppers admit using their phone to find a better deal. Marketing to millennials – Startup with Black Friday. 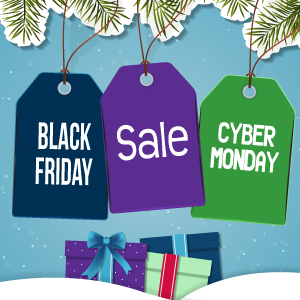 Most customers from 18-29-year-olds usually begin their holiday shopping in November, and Black Friday is the most favorite shopping time for them when compared with people of other ages. With senior set – About 25% shoppers at the age of 65 and older start shopping in September or earlier. But the largest group of last-minute shoppers is also from seniors; 30% of shoppers at the age of 50 and more will wait until Cyber Monday. Thinking of a flash sale – The limited- time sales will attract most of the youth while it declines with ages. While 54% millennials love this program, there are only 39% people from 30-39 years old and 16% from 50 to 64. Planning to host a doorbuster sale – 70% retailers think these to be useful sales tools, but only 28% of holiday shoppers love them. 1. Multistore pricing: Allows store owners to set and present suitable prices for the specific product in each store view of the corresponding store. Also, store owners can apply powerfully and exactly price policies to precisely target customers to enhance sale performance. 2. Social login: This extension will help to get more registrations due to its convenience of login via social network accounts. Besides, all customers’ activities will relate to their social pages, which can effectively optimize your viral marketing. 4. Frequently Bought Together: Suggests customers buy more and increase total some sales. Furthermore, it also satisfies customers because of giving them a useful recommendation to optimize the product’s functions. 5. Advanced Search and AutoComplete Reduce customers’ searching time by suggesting and an auto-completing name of product via very first letters. 6. Full Page Cache: Saves more time for customers due to increases loading speed. By decreasing database load on your server, the online store will enhance customers’ experience, and the sale conversions and store revenue are on the way to grow up. Online shop owners usually have their plan in holiday seasons. However, this post can be valuable information for them to arrange and build up a more efficient marketing strategy, essentially when the holiday season is coming!